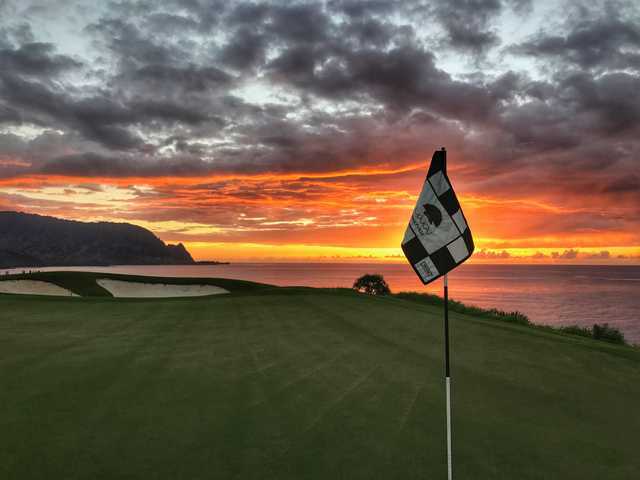 Makai Golf Club at Princeville is a 27-hole layout that was carved into a sloping hillside, perched high above the Pacific overlooking the beautiful Hanalei Bay. 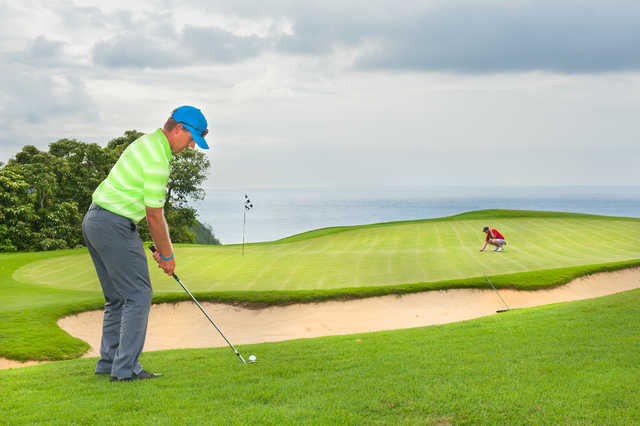 The course enjoys an unrivaled setting with both mountain and ocean views. 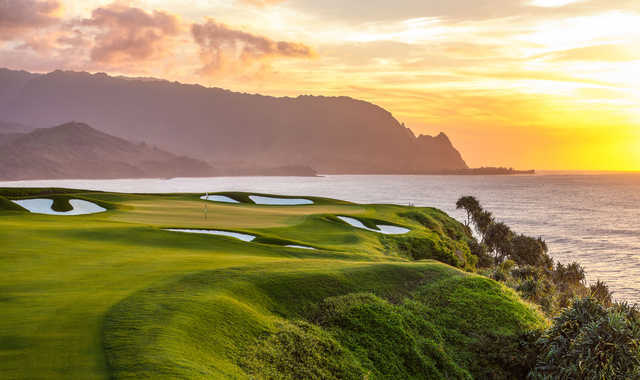 Makai Golf Club at Princeville is a 27-hole layout that was carved into a sloping hillside, perched high above the Pacific overlooking the beautiful Hanalei Bay. 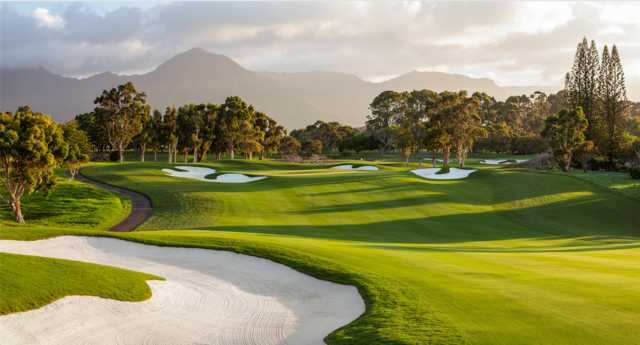 The course enjoys an unrivaled setting with both mountain and ocean views. The club was once three different nines, but a major renovation in 2010 combined the Ocean and Lakes nines into an 18-hole championship course while the par-36 Woods remained a nine-hole course. The courses are Robert Trent Jones Jr.'s first design on Kauai, where he would go on to design four other golf courses. The signature hole comes on the front nine, the former Ocean course. The par-3 third hole offers not only a stunning view of the bay but also a challenging test that plays from an elevated tee to a water-protected green 100 feet below. Designed by: Robert Trent Jones, Jr., Robert Trent Jones, Jr. The course was just lovely in January, 2013 and we'll play it again next January. Hard to top the views and it offers a nice challenge for men and women. The course is now playing beautifully after 1 year since re-opening. Love the 13th 225 yd par 3 into the wind toward the ocean and then the 390 yard par 4 14th that one can easily hit the green from the T! The 14th hole borders the ocean and multiple canyons and one slip and you can be lost forever! The renovation of Makai has sparked similar rejuvenations across the island...Poipu Bay, Kauai Lagoons, and the Prince Course have or are currently re-doing greens, bunkers, etc. Locals are grateful as we get to play golf all year! Renovation is complete and the course is starting to look really good with Paspalum. Greens were the best we saw during the week in Kauai and many of the holes have been enhanced. I played this course before the renovation and you could see how much potential it has. There is actually more ocean frontage on the Makai, including a par-3 shot over the ocean on the 6th, than the more prestigious Prince course. I'm looking forward to getting back and see how the upgrade has affected the course as I'm sure it will be rated among Hawaii's best if they do it right.